The International Criminal Court (ICC) has reversed a ruling allowing Kenyan President Uhuru Kenyatta to attend only parts of his trial in The Hague. Judges had ruled in October that he only needed to be there for key parts of the case, which begins in February. Mr Kenyatta's legal team had argued that attending the trial would prevent him from governing the country. He denies charges of organising ethnic violence after the 2007 election in which some 1,200 people died. 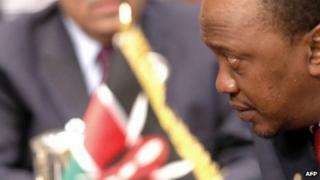 Earlier this month, the UN Security Council rejected a request from African states to suspend the ICC trial of President Kenyatta and that of his deputy William Ruto, which has already begun. The two men were on oppositions side of the political divide in 2007 and both deny the allegations they face at The Hague. In a statement, the ICC's trial chamber said when Mr Kenyatta's trial begins in February, he should, "as a general rule", be present in court. It reconsidered its decision after "legal clarifications provided by the Appeals Chamber in its recent judgment on the matter". "Any future requests to be excused from attending parts of the trial will be considered on a case-by-case basis," the statement said. Mr Ruto's trial, which began in September, was adjourned for a week to let him return home to deal with the aftermath of the Westgate shopping centre attack in which 67 people died. But the court has ruled that he too must attend most of his trial - and be excused only on a "case-by-case" basis. Mr Kenyatta will become the first serving head of state to go on trial at the ICC. Could Westgate deal a fatal blow to the ICC?